Question: Hey Donna, I was looking through your plant photos on Facebook and was wondering what kind of silver trays those are that you have you plants in? I can't think of the name of them, it's on the tip of my tongue and driving me nuts lol. Answer: They are Hefty aluminum cookie sheets with clear plastic to keep the aluminum from oxidizing. fungus. Do you have any suggestions for me? and even though we do not run it hard,it does take some humidity out of air. I have not misted my violets for fear of causing disease issues. just start to flag before giving it more water. Is that practice okay? leach with clear water monthly. The temperature in our home is around 78.
full spectrum sunlight flourescent bulbs 12 hours a day. Answer: There are a few possibilities for the buds dying. I have the opposite problem you have, too much humidity (65-80%), so it could be a result of the spray I used to prevent powdery mildew. It could also be a result of shipping or the lower humidity levels in your home. The plant should be fine once it adjusts. I have used a humidifier in the past when my humidity dropped to 40% and the plants' buds all started to dry up. I do not reccomend misting the plants. It would be better to run a humidifier or place bowls of water near the plants. Another suggestion would be to place pebbles or glass stones in a shallow dish and put water in the dish, but do not cover the stones. Place the plant on top of the stones, but do not let the pot sit in water. This will also provide humidity. As for watering, I also use Jack's Violet food when I water. You seem to be doing everything right except for letting the plants get too dry. You should not wait until they start to droop. This causes the tender feeder roots to die, making it harder for the plant to take in water. It could actually cause the plant to drown when it is finally watered, or it's roots to rot. You should water when the surface of the soil is dry to the touch. It is normal for the rootball to be damp. Hope this helps. them in this heat. What is your policy on shipping? Answer: I always check the temperatures for the area I ship to. If the temps are going to be under 95 degs I will ship the plants in insulated boxes. If the temps are higher I will hold off shipping until the temps are lower. Question: Question for you, what causes the lower leafs on a healthy flowering plan to get soft, mushy and lifeless? I cut them off, and after a while the plant looks like a tree with the bottom bare. I keep the plants moist & water in summer 2 x's a week when almost dry. Answer: Leaves will turn mushy when the plant is over watered. The soil needs to be dry to the touch before the next watering. If the soil is constantly moist, the leaves will continue to rot and eventually the roots will rot too. The bare part of the stem that is exposed now from continually losing leaves needs to be scraped and buried beneath the soil. DO NOT put the plant into a larger pot unless the pot is less than 1/3 the size of the leaf diameter of the plant! You can just as easily kill the plant by overpotting it. Remove some of the old soil so that you can get the "neck" of the plant below the soil. You would be better off to take action now while the neck is still manageable. Good luck and happy potting! Question: A leaf broke off with stem & I put a pencil hole in the soil the plant was in & inserted the whole stem & leaf. Will it re-root & grow? Normally with my green plants, I put the cuttings in water until they re-root, then pot them. Answer: When I root leaves, I cut the stem down to about 3/4" in length, put it in moist African Violet soil or seed starting mix in it's own small pot, then place the pot in a clear plastic bag. Keep the leaf in bright light, but not direct sun for about a month. Check for babies. Once you see baby plants emerge, open the bag for air and keep open for 24 hours to acclamate the plantlets. After 24 hours, you can remove them from the bag and treat them like your other violets. When the baby leaves are the size of quarters, I separate the plantlets and put them into individual pots. Good luck with your project! Question: Really I just have a question about one of the plants I ordered. I ordered "Marina" in a 3 " pot & it has now bloomed, but solid purple, not striped w/ white as pictured; is there a reason for this? I know the plants are getting plenty of light and are otherwise healthy. Thanks for any info you can give me! Answer: That variety has a tendency to loose it’s white coloration in warmer temperatures. My plant room has been averaging between 80 to 85 degrees for the last month or more. Even my Marina parents have turned all blue. I expect the white will return when the temperatures return to 65 degrees at night and 70 to 75 during the day. Question: Hi, Donna. I was wondering if I'm doing something wrong. One of the four violets I received is looking droopy. All of the violets are in violet pots, that is, in a porous solid pot set in another pot which has the water in it. I treated them all essentially the same and they all are sitting in a window facing east. Three of them look healthy and happy and the fourth one looks perky enough in the middle but all the edge leaves are drooping. The droopy one is called "Wrangler's Swinging Blues." The others are "Music Box Dancer," "Pow Wow" and "Starry Night." Do you suppose it's just transplant shock? Or maybe that's just the plant's natural look? Or is there something I've done wrong? Answer: The first thing I noticed is the pot is too big for the plant. It probably is in shock. That variety also does not like it's soil constantly wet, so it's roots might be rotting. I would take the plant out of the pot and check it's roots. They should be white, not brown or black. If the roots are rotted or gone, you will have to remove the decay until you find healthy roots or a green healthy stem. Using violet soil, you should then remove the wilted leaves and put the plant into a small pot.Moisten the soil, do not soak! Then place plant pot and all into a clear plastic bag and seal it. Place the plant in a warm, bright location (no direct sunlight) for about three weeks. It will reroot itself. If the plant continues to droop, check to make sure all rot was removed, and that the soil did not completely dry out. I have never used the violet pots myself, but I have had people say that their plants do well, or that they died when they used them. I think a lot has to do with each individual variety of violet and the environment they are grown in. I would not recommend using self watering pots in a cool, damp environment. Let me know how you make out. Response: Thanks for your help. The violet is a lot happier now. 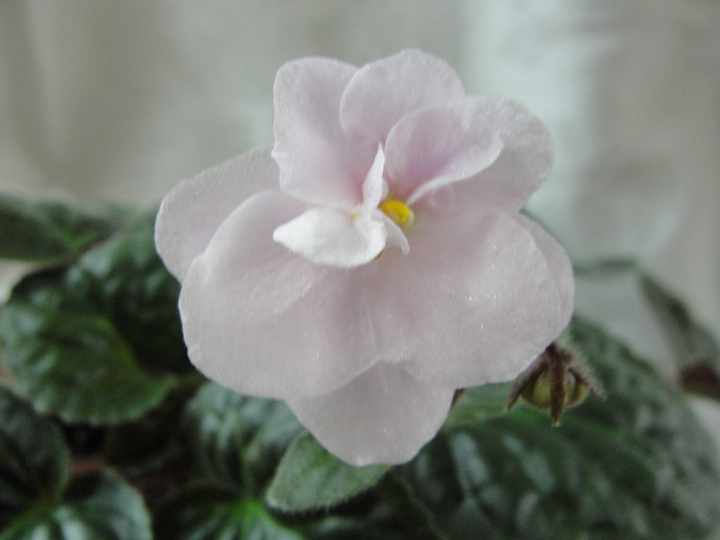 When I unpotted it and put it in a smaller pot, I discovered that the "special" african violet pot that I had been using left the short roots on the new plant completely dry. The poor thing was dying of thirst sitting in a container of water. I guess I should have dampened the plant as I was orginally potting it so the cappillary action would have some moisture to work with. Question: What is the correct way to measure distance from the bottom of the tubes to the top of the plants?? i have been using a measuring tape placing the flat steel end of the beginning of the measuring tape on the bottom of the tube and pulling the measuring tape down to the top of the plant and lining up to the 11 inch mark (10-12 inches is the standard so i went for 11 that way im in the middle of the range as a safe bet??). is this the correct way?? or is there a more accurate way?? Answer: Relax! You're doing just fine! You want to have the tubes 10"-12" above the top of the plant. It is not an exact science. Some varieties require more light than others. The plants will let you know if they are unhappy. If the leaves look like they are reaching for the light and won't relax, put them on another shelf where you can lower the light an inch or two. Violets are hardy, so if you make a mistake you have time to correct it without causing permanent damage to the plants. Question: Hi Donna, I have a potting question.... miniatures/semi-miniature trailer violets, do they over time ever need to be put into a larger pot over 2.50? Answer: The trailers can be moved up into a 3" pot, and when they overgrow that pot they can be moved into a 4" pan pot. You will need to use the pan pots because they are shallow and will allow the plants to spread out. Have fun re-potting! Response:Thanks Donna for getting back to me. I did order some pan pots from Bluebird....but I didn`t see 4" pan pots olny 5. "You don`t sell them... Do you? Reply:I usually end up making my own 4" pan pots out of the small clear deli containers (1/4 lb size?) or the containers from the Betty Crocker Warm Delights mini bowls. Whatever you use, be sure to cut holes in the bottom for water to go through. I found out by mistake that just making slits is not enough. Please don't make the mistake of jumping from a 3" pot to a 5"pan pot. You will probably kill your plant. Good luck!